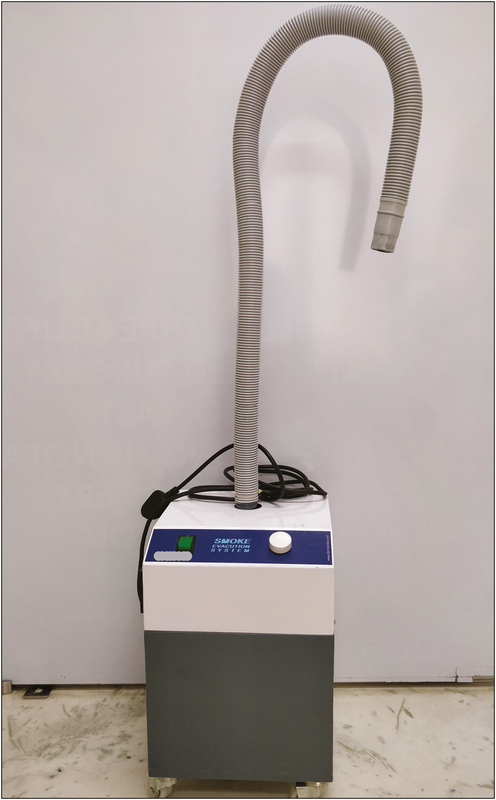 Surgical plume with vaporized tissue particles, pathogens, and toxic gases emanating during dermatosurgical procedures is an occupational hazard to the dermatosurgeon, and protective measures must be taken to prevent their inhalation. Smoke evacuators are devices that capture and filter the plume generated during electrosurgical procedures or laser procedures, thereby maintaining a safe environment for the surgical team and the patient. A smoke evacuation system should be appropriately selected depending on the need of the facility. The objective of this article is to outline the health hazards of the smoke by-product of electrosurgery and lasers and provide details about safety measures and smoke evacuation systems. Key messages: Surgical smoke is a biochemical hazard comparable to chronic second-hand smoking. Constant exposure can result in serious health issues for the doctor, supportive staff, and patient. Despite conclusive evidence, smoke evacuators are seldom used in a dermatology clinic. The importance of smoke evacuation is probably underemphasized and should be strictly implemented in dermatology clinics for a safe working environment. Electrosurgical and laser procedures are regularly performed in a dermatology clinic and generate smoke that can be harmful to the doctor, nurses, and the patient. With the frequency of these procedures increasing every year and with mounting evidence about the hazards of surgical plume, maintaining a smoke-free environment is becoming very important. Surgical smoke comprising 95% water and 5% particulate matter is produced as a by-product when there is thermal destruction of target cells leading to rupture and release of cellular contents. It poses significant risk as a respiratory tract irritant and mutagen, and as a vector for infectious particles. Surgical plume has been compared to smoking unfiltered cigarettes, with electrosurgical plume being twice as harmful as compared to lasers, hence making its complete evacuation necessary. Although several guidelines and articles have been published about smoke evacuation in the Western literature, there is paucity of publications in Indian literature. This article aims at discussing methods and proposed strategies to minimize the hazards of surgical smoke. Exposure to toxic organic compounds and infectious particles in surgical smoke can lead to burning and irritation in the eyes, pulmonary effects, risk of transmission of infection, and carcinogenesis. [Table 1] shows the risks of surgical smoke. Around 77% of particulate matter within surgical smoke was found to be less than 1.1 µm in size. Electrosurgical devices and lasers create particles of roughly 0.07 and 0.31 µm, respectively. Deposition of particles in the bronchioles and alveoli can take place when the size is less than 2 µm, leading to chronic irritation, emphysema, interstitial pneumonia, and bronchitis. Standard surgical masks can filter particulate matter greater than 5 µm in size and hence do not provide any protection against electrosurgical and laser plume.,,,[Table 2] depicts comparison between electrosurgical and laser plume. Tissue pyrolysis and destruction leads to release of toxic gases that impart a noxious odor to the surgical plume. Chemical contents of the electrocautery plume are mostly hydrocarbons, phenols, nitriles, and fatty acids. Some of these organic compounds such as acrylonitrile, benzene, butadiene, toluene, acrolein, and formaldehyde have been identified as carcinogens. Tissue oxygenation is affected adversely with compounds such as hydrogen cyanide and carbon monoxide. Effects of short-term exposure to acrylonitrile and benzene include eye irritation, nausea, vomiting, headache, dizziness, weakness, and light headedness, whereas chronic exposure can result in higher incidence of cancer.,,[7–9] Carbon monoxide, hydrogen cyanide, formaldehyde, benzene, and acrolein are also present in plume associated with ablative lasers. Presence of infectious particles such as human papillomavirus and bacteria in surgical smoke has been studied with viral transmission being demonstrated in animal studies. Aerosolization of viral particles in the plume of CO2-laser-treated warts has been confirmed as early as 1988 by Garden et al. Two cases of laryngeal papillomatosis in health care professionals secondary to treatment of anogenital condyloma acuminata with electrodessication and laser have also been reported.,Viable bacteria such as Staphylococcus, Corynebacterium, and Neisseria More Details have also been detected in plume associated with laser resurfacing. Presence of HIV proviral DNA was also reported in vaporous debris from CO2-laser-treated HIV infected tissue culture pellets by Baggish et al. Viable bacteria and viruses have been demonstrated on electrosurgical electrodes, thereby proving that the electrical discharge does not sterilize the electrode and is capable of creating an aerosol of blood and tissue droplets that can transfer infectious agents. An in vitro study has identified the presence of viable malignant cells in surgical smoke, thereby reflecting the importance of smoke evacuation and respiratory protection while treating cutaneous malignancies. The infectious and noninfectious hazards of surgical plume are enumerated in [Table 3] and [Table 4], respectively. In practice, many dermatologists do not routinely adopt protective measures while using lasers or electrocautery despite conclusive evidence against its potential biohazards. Basic precautions include good general room ventilation, masks, suction, smoke evacuators, and protective eye glasses. Routine surgical masks are useful but not sufficient. They offer protection against particulate matter of size greater than 5 µm and have a reported filtration efficiency of 91.53%. Most of the particulate matter in surgical plume is less than 1.1 µm in size and hence high-filtration masks have been developed to offer more protection. General ventilation: General ventilation, also referred to as dilution ventilation, controls the environment by diluting and replacing contaminated air before concentration of chemicals reaches unacceptable levels. Mechanical ventilation by exhaust fans slowly removes contaminants dispersed in the air and is suited for procedures with low and uniform rate of smoke generation. Its disadvantage includes dispersion of particulate matter from the source into the working environment, thereby exposing the health care professional and patients to the hazardous plume and odor. It is best used in conjunction with smoke evacuation devices to remove surgical plume that may have escaped the capture device. General exhaust ventilation is depicted in [Figure 1]. These can be used for procedures that produce small amounts of plume as the air movement generated may only be about 2 cubic feet per minute. A filter needs to be placed in the existing wall suction line between the suction canister and wall connection to purify the air; otherwise the surgical smoke can corrode the suction pipes and cause contamination. The in-line filter should be changed according to the manufacturer’s instructions and contaminated filters should be disposed properly.,Standard suction systems with in-line filters are an inexpensive method of surgical smoke evacuation in an outpatient setting where procedures of shorter duration generating small quantities of smoke are performed. [Figure 3] illustrates a schematic diagram of the wall suction unit with an in-line filter. I.Turbine pump (10 A): It moves air at 60L/min after a delay of 3s. There is no occlusion feature to shut off the unit even if the evacuation tubing gets clogged. More efficient pumps are now available. II.Rotary vein pump (2 A): This is a small powerful pump with suction five times greater than the turbine pump. It is more efficient in air movement and creates an instant negative pressure. It also shuts off the unit if the tubing gets occluded. 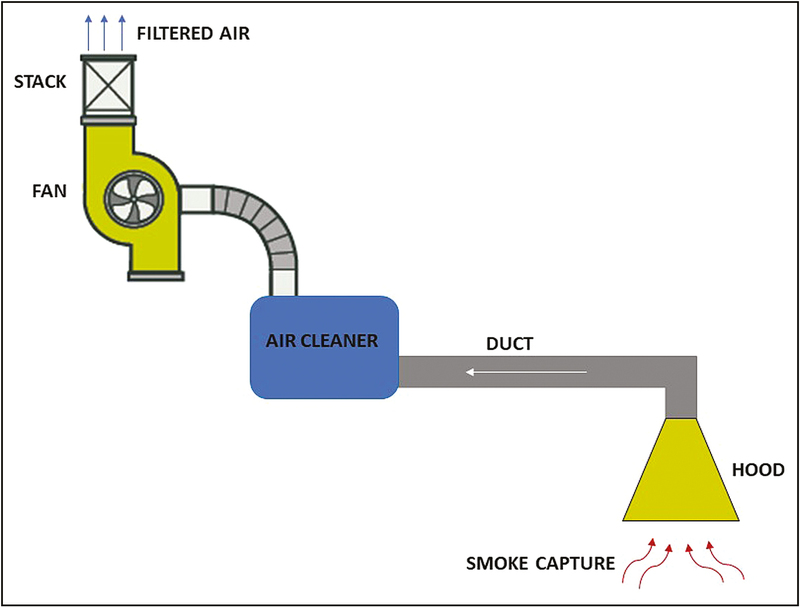 Filtration efficiency of a smoke evacuation system is very important. It depicts the number of particles that pass through the filter. I.Charcoal filter: Activated charcoal is capable of absorbing gas and vapor. It helps in elimination of strong-smelling gases. Coconut shell charcoal is better at absorbing particulate matter in comparison to wood-based charcoal due to greater internal pore area. II.HEPA: It is used to filter suspended compounds. It retains 0.3-µm-sized particles at an efficiency rate of 99.97%. III.Ultra low particulate air (ULPA): It is more powerful than HEPA and retains ultrafine particles sized 0.1 µm with an efficiency rate of 99.9999%. It is a depth filter where matter is filtered by different methods depending on the particle size. This type of filter is found in smoke evacuators today. Change of filter: Most of the evacuation devices have an inbuilt alarm or an indicator light to signal a required change. A change of filter is mandated when the suction pressure decreases or there is a lingering odor in the air. The contaminated filter may be considered as infectious or regulated waste depending on the waste disposal protocol of the facility. These are available in varying sizes depending on the amount of smoke that needs to be evacuated. With the same suction strength, a tubing with a wider internal diameter may increase the airflow by 5–10%. A smooth inner lumen will further decrease the whistling noise produced by corrugated tubes. Reducer fittings that connect a smaller suction tube attached with the electrosurgical instrument to a larger smoke evacuation tubing are also available. The inlet nozzle of the tubing should be held close to the site of smoke generation to capture maximum plume. Many devices such as evacuation wands and pencils, which can attach to the electrosurgical and laser equipment, are available for thorough and adequate smoke capture. A 2.2-cm wand when placed at a distance of 7.5cm from the smoke source captured only 53% of the smoke in comparison to 99% capture when placed at 2.5cm. A standard electrosurgical unit (ESU) pencil has an internal diameter of 1cm and incorporates the smoke tube for plume evacuation at the tissue impact site. It activates when the ESU pencil is in use and unlike the traditional handheld nozzle does not have to be held by the surgical team members. Foot pedals can be used for turning the system on and off. Alternatively, automatic activation devices can be used, which turn on the evacuator when the electrosurgical or laser equipment is being used. Some systems also have an electronic control panel to facilitate and maintain functions. [Table 5] enumerates the importance of a smoke evacuator. The basic model of a smoke evacuator with an inlet, tubing, and suction unit is depicted in [Figure 4]. The plume here is collected in a central area for filtration via tubing attached to different surgical rooms. This system involves regular cleaning and flushing of internal tubing to prevent accumulation of particulate debris and pathogen growth. A failure of the central system will render smoke evacuation ineffective in all the connected surgical rooms. This system is best suited for an inpatient facility where multiple open procedures are performed and may not be ideal and cost-effective for an outpatient setting. Evaluation of smoke evacuators before purchase,,[26–29]: Before purchasing a smoke evacuator, a comprehensive evaluation of the following should be performed. Criteria for a good smoke evacuator are enumerated in [Table 6]. 1.Filtration efficiency: Most current smoke evacuators use ULPA filters. Flow rate: A minimum flow rate 0.012 m3/s is recommended and depends on the type of pump. A system with variable flow rate settings covers broad range of procedures. Noise level: A noise level of 60 Db or less is recommended and depends on the size of the tubing and the condition of foam padding in the smoke evacuator. Corrugated tubes produce more noise. Mobility: An easily mobile smoke evacuator can be moved from one room to another. Cost-effectiveness: Disposables such as filters, tubing, and nozzles will have to be purchased on a continual basis. Economical replaceable prefilters are now available to minimize wear and tear of the main filtration unit. The cost may vary depending on the company and the type of smoke evacuator model chosen. Maintenance: Maintenance should be simple and should be performed regularly as per the manufacturer’s instructions. Awareness and knowledge are the keys in bringing about a change in the attitude of dermatologists toward the risk of exposure to noxious and hazardous surgical plume and their potential adverse effects. Incorporating the above subject in the residency curriculum will help in an understanding and promotion of safe smoke evacuation methods. Continuing education of the entire surgical team is a very important step in minimizing and eliminating surgical plume. Exposure to surgical plume has been found to have the same effect as chronic second-hand smoking. Despite the health hazards, standard of care and protective measures in dermatology clinics are not adequate. Objective data have confirmed the risk of direct physical injury, infection transmission, and mutagenesis in animals; more studies are required in human populations to investigate the aforementioned concerns. We recommend that prevention of inhalation of surgical plume should be of utmost importance to the dermatologist and the supporting staff. With mounting medicolegal awareness among patients, a minimum standard of care that reduces hazard exposure and transmission of infection has to be maintained while doing electrosurgery and laser procedures. Awareness and management strategies should be a part of the training curriculum for both doctors and the supportive health care providers. Smoke evacuators are a must for any dermatosurgical or laser clinic with easy, effective, and safe plume evacuation. The smoke evacuators available today are compact, portable, and easy to use. Although some systems may be expensive, they usually last for a long time with minimal maintenance. In addition to smoke evacuation practices, high-filtration masks should also be worn by the surgical team as they offer superior protection compared to standard surgical masks. The smoke capture device should be held less than an inch away from the treatment site to achieve efficient evacuation. 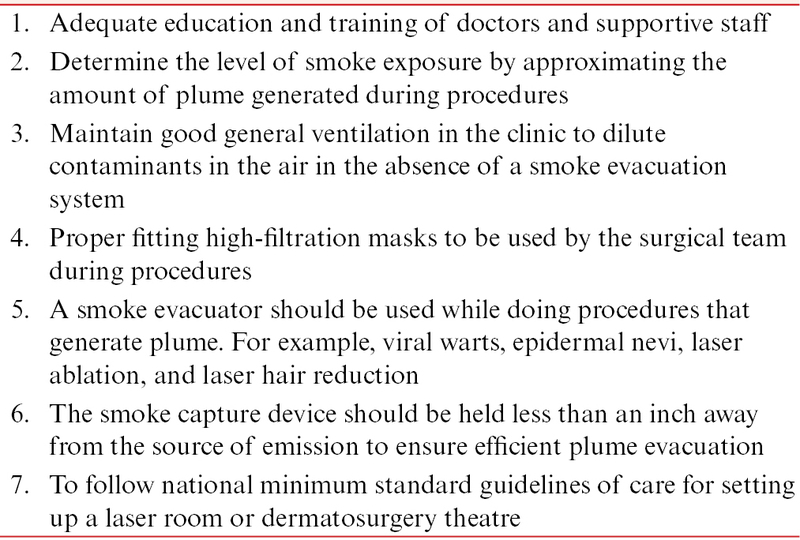 Standardized guidelines for surgical smoke evacuation should be laid down and followed strictly within the dermatology community with practices that are easy to implement and at the same time efficient in plume evacuation. A multidisciplinary approach with education of staff, good general ventilation, use of high-filtration masks, and a smoke evacuator is ideal. Hazard reduction practices that need to be implemented in a dermatologist’s clinic are enumerated in [Table 7]. Lewin JM, Brauer JA, Ostad A. Surgical smoke and the dermatologist. J Am Acad Dermatol 2011;65:636-41. Oganesyan G, Eimpunth S, Kim SS, Jiang SI. Surgical smoke in dermatologic surgery. Dermatol Surg 2014;40:1373-7. Tomita Y, Mihashi S, Nagata K, Ueda S, Fujiki M, Hirano M, et al. Mutagenicity of smoke condensates induced by CO2-laser irradiation and electrocauterization. Mutat Res 1981;89:145-9. Ulmer BC. The hazards of surgical smoke. Aorn J 2008;87:721-34; quiz 735-8. Taravella MJ, Viega J, Luiszer F, Drexler J, Blackburn P, Hovland P, et al Respirable particles in the excimer laser plume. J Cataract Refract Surg 2001;27:604-7. Baggish MS, Elbakry M. The effects of laser smoke on the lungs of rats.Am J Obstet Gynecol 1987;156:1260-5. Barrett WL, Garber SM. Surgical smoke: a review of the literature. Is this just a lot of hot air? Surg Endosc 2003;17:979-87. Alp E, Bijl D, Bleichrodt RP, Hansson B, Voss A. Surgical smoke and infection control. J Hosp Infect 2006;62:1-5. Sagar PM, Meagher A, Sobczak S, Wolff BG. Chemical composition and potential hazards of electrocautery smoke. Br J Surg 1996;83:1792. Kokosa JM, Eugene J. Chemical composition of laser-tissue interaction smoke plume. J Laser Appl 1989;3:59-63. Garden JM, O’Banion K, Sheinitz LS, Pinski KS, Bakus AD, Reichmann ME. Papilloma virus in the vapour of carbon dioxide laser in the treatment of warts. J Am Acad Dermatol 1995;32:436-41. Hallmo P, Naess O. Laryngeal papillomatosis with human papillomavirus DNA contracted by a laser surgeon. Eur Arch Otorhinolaryngol 1991;248:425-7. Calero L, Brusis T. [Laryngeal papillomatosis - first recognition in Germany as an occupational disease in an operating room nurse]. Laryngorhinootologie 2003;82:790-3. Capizzi PJ, Clay RP, Battey MJ. Microbiologic activity in laser resurfacing plume and debris. Lasers Surg Med 1998;23:172-4. Baggish MS, Poiesz BJ, Joret D, Williamson P, Refai A. Presence of human immunodeficiency virus DNA in laser smoke. Lasers Surg Med 1991;11:197-203. Fletcher JN, Mew D, DesCôteaux JG. Dissemination of melanoma cells within electrocautery plume. Am J Surg 1999;178:57-9. Lu W, Zhu XC, Zhang XY, Chen YT, Chen WH. [Respiratory protection provided by N95 filtering facepiece respirators and disposable medicine masks against airborne bacteria in different working environments]. Zhonghua Lao Dong Wei Sheng Zhi Ye Bing Za Zhi 2016;34:643-6. Chen CC, Willeke K. Aerosol penetration through surgical masks. Am J Infect Control 1992;20:177-84. Georgesen C, Lipner SR. Surgical smoke: risk assessment and mitigation strategies. J Am Acad Dermatol 2018;79:746-55. Ball K. Lasers: The perioperative challenge. 3rd ed. Denver (CO): AORN; 2004. Smalley PJ. Laser safety: risks, hazards, and control measures. Laser Ther 2011;20:95-106. Hunter JG. Laser smoke evacuator: effective removal of mutagenic cautery smoke. Aesthetic Plast Surg 1996;20:177-8. Ball K. Controlling surgical smoke: A team approach. Phoenix (AZ): IC Medical Inc; 2004. Yeh C. Surgical smoke plume: principles and function of smoke, aerosols, gases, and smoke evacuation. Surg Serv Manage 1997;3:41-4. Schultz L. An analysis of surgical smoke plume components, capture, and evacuation. Aorn J 2014;99:289-98. AORN. Guideline summary: surgical smoke safety. AORN J 2017;105:498-500. Fencl JL. Guideline implementation: surgical smoke safety. AORN J 2017;105:488-97. AORN. Guideline at a glance: surgical smoke. AORN J 2017;105:250-51. Chavis S, Wagner V, Becker M, Bowerman MI, Jamias MS. Clearing the air about surgical smoke: an education program. AORN J 2016;103:289-96. Rajendran SC, Omprakash HM. Standard guidelines for setting up a dermatosurgery theatre. Indian J Dermatol Venereol Leprol 2009;75:76-82. Dhepe N. Minimum standard guidelines of care on requirements for setting up a laser room. Indian J Dermatol Venereol Leprol 2009;75:101-10.